The Rancilio espresso machine is perfect for home use. And with over 200 verified five star ratings its also one of the best rated pump espresso coffee machines for people serious about espresso. If you wish for excellent espresso, as well as a dependable machine you cant wrong. Before buying though, you need to know that besides its beautiful looks, the Rancilio Silvia has plenty of other great features. Rancilio began in the 1920s. Over the years, the company has maintained its long tradition of manufacturing high-quality espresso machines. Rancilio’s best known and best selling home espresso machine is the Rancilio Silvia espresso machine which was first introduced in 1997. It was originally intended not for sale, but as a gift to vendors and international merchants of Rancilio products. However, its popularity among coffee users has grown to the extent that the Silvia espresso is now Rancilio’s number one selling espresso machine and one of the most bought espresso machines in the market. The Number 1 Rated Rancilio Silvia Espresso Machine is virtually indestructible. It is constructed from stainless steel and cast iron. The components and parts are commercial or semi commercial quality and spares are easily obtainable. The 2009 v3 model is the very latest version and it still offers the strong brass boiler and sturdy pump which allows the Silvia to surpass its competition. But the new improvement and upgrades for the Rancilio Silvia incorporate an industrial grade, fully articulating steam-wand utilizing a 1-hole tip designed for enhanced milk frothing. Also included is a new ergonomic grip for that steam wand to help make it simpler to open and close. A new ergonomic handle for the heavy-duty porta-filter has also been added. Along with a 1 Year Warranty. The Silvia is a ‘hands on’ pump espresso machine. The manual/guide offers some instructions on how to use it and you will be able to make good quality coffee in a matter of minutes. But with practice and good Barista skills you will become naturally adept at working with the Silvia in a matter of days. Grind fresh coffee (3 to 4 days old) for better tasting espresso or better yet, try roasting your own coffee for a hobby. There are websites dedicated to teaching you how to roast your own coffee. Trust me, you will be surprised at how much you enjoy it. The Silvia is a top quality machine and will give you the espresso shot you always dreamed of. But you will need to work for it. The main issue is that as a single boiler espresso machine it has around a 20 degree variance between the highest and lowest brew temperatures. This variance needs to be managed, so it’s another factor to master along with your other barista skills when trying to find the sweet spot on your shot. 2017 Update: The new Rancilio Silvia M edition of this great machine features a light to indicate when it has reached optimal temperature. So you need to decide upon how you want to handle the brewing heat range. And for this there are two options. Your first option is to use a process is known as “temperature surfing” where you manually judge temperature. You let the machine heat up to its highest temperature, the boiler light will then switch off and you let it cool down to your estimated optimum (usually between 30-60 seconds). The second option is to fit a digital temperature control known as a PID (turning a $630 machine into a $1000). A PID accurately regulates the internal temperature of the machine for a consistency in the quality of brew every time you make it. The PID controller kit is designed to retrofit into the Rancilio Silvia espresso machine (May 2000 – May 2006 models). Many users prefer to keep Rancilio espresso machines in their original state because they are more ‘hands on’ and I have to say that when you get it right it does give you a warm feeling and sense of achievement. But I also think that there are enough authentic factors more important in the espresso making process, and temperature control can make life easier and take a little unnecessary stress out of the process. If you choose to go this route then it’s not a difficult task to retrofit a PID Temperature Control to the Rancilio Silvia espresso machine. Thousands of users have done this retrofit, it really is quite simple and takes around one hour, so don’t be afraid if you want to have a go at it. Rancilio espresso machines have only one 12 oz copper boiler that is small enough to heat up relatively quickly to make the foam you need for a latte. However, the single boiler means that you cannot brew coffee and froth milk at the same time. After making a shot of espresso, you will need to wait for the boiler to heat up before you get the steam to froth your milk. Unlike what the manual says, you may want to prepare your shot of espresso before steaming your milk. But the milk will be steamed perfectly. These Rancilio espresso machines have a large removable reservoir that makes it easy to clean daily. When cleaning, remember to de-scale the boiler before cleaning the brew-head. You will need to buy a few brushes including one for the brew-head. Any espresso machine requires the appropriate accessories in order for you to get a quality cup of coffee every time. Without the proper equipment, even the best and most expensive espresso machines will fail. Rancilio espresso machines do need a couple of accessories to get top performance. The actual pump on this machine creates a good 9 bars, which usually means that a cheap grinder will not grind your coffee fine enough. So from this machine you won’t get good results unless you invest in a quality burr grinder and they do not come cheap. Expect to pay no less than $300 for a good burr grinder, select one like the Rancilio Rocky Coffee Grinder. Check that you have a tamper that it fits well, if it doesn’t, get one that does. There’s a lot of expensive tampers for sale, but I would go for the 58-Milimeter Rattleware Tamper, it doesnt cost a fortune, its round handled and fits the Rancilio basket about as close as you can get. You may also want to buy a digital precision scale to weigh your beans if you are keen on keeping the taste of your espresso coffee consistent every time. As always with a machine that requires a decent level of skill and some investment in time I saw a few negative reviews on Amazon, but the positives far outweighed the negatives. You simply can’t get more than 100 five star ratings unless it’s a true quality product. And the time spent on some of these customer reviews was amazing. Every-day users have a lot of love for this machine which speaks volumes. 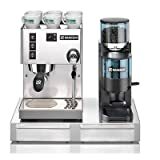 Rancilio espresso machines are not cheap, but with 0ver 200 five star ratings on Amazon The Rancilio Silvia is our number 1 rated pump espresso machine for people serious about espresso. It’s an attractive appliance which has excellent construction and features in abundance. A brass-boiler and brew-group, a substantial water tank, plenty of steaming pressure and it’s notoriously dependable. You can tell it’s a great machine by the fact that it has been made and sold for more than ten years with very few changes. If you wish for excellent espresso, as well as a dependable machine, you cannot make a mistake with Rancilio espresso machines. Please take a little time to understand the correct method, then put it all together, and you might discover just how great espresso can be.